Hi there! 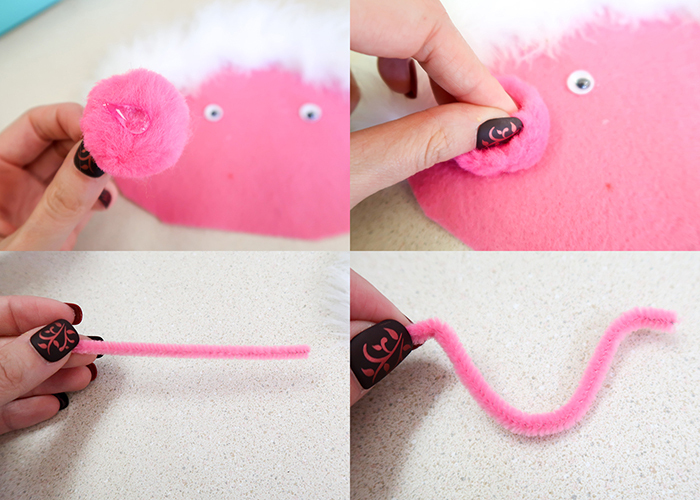 Today I’m going to show you how to make this really cute (and not one bit scary!) 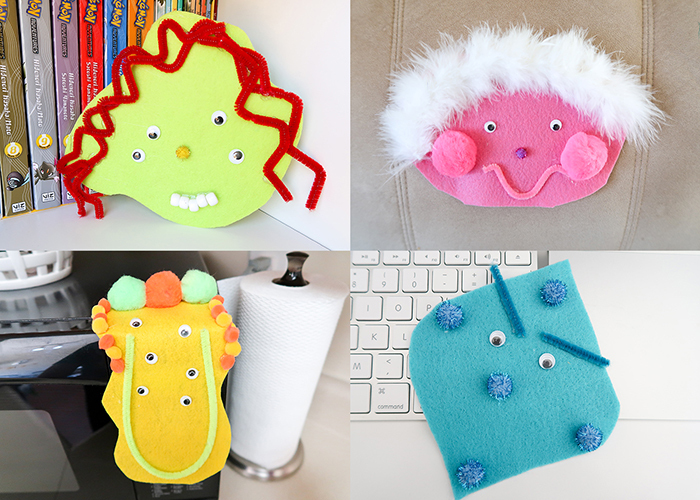 Fun Felt Monsters Project! 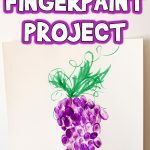 This is a great project to keep your kids busy, and its a fun way to use up scrap crafting supplies from other projects. 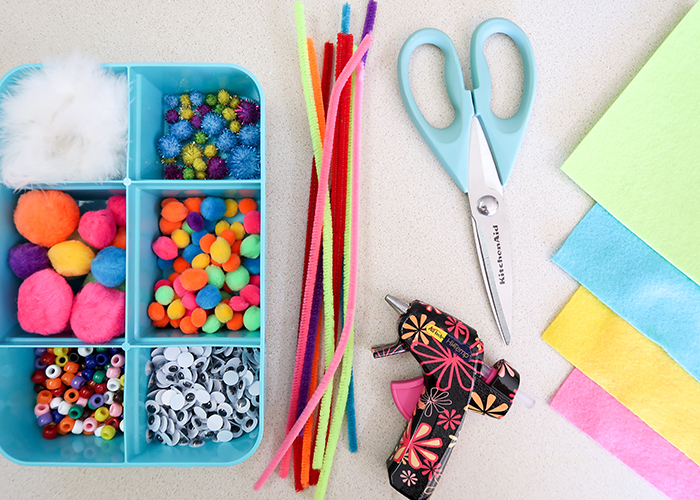 Here’s what you’ll need! 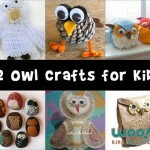 You might also like our recycled box monsters craft! 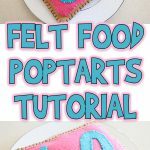 Felt in a variety of colors. Anything else you’d like to add to your monster! 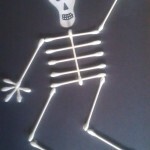 I’m going to show you how I made each of my monsters, but you can use your imagination and come up with your very own creatures. 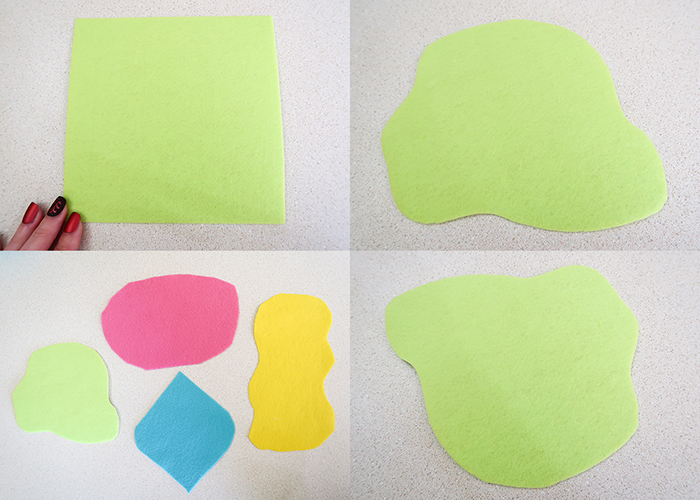 Start by taking each of your felt colors, and use your scissors to cut it into a fun shape. 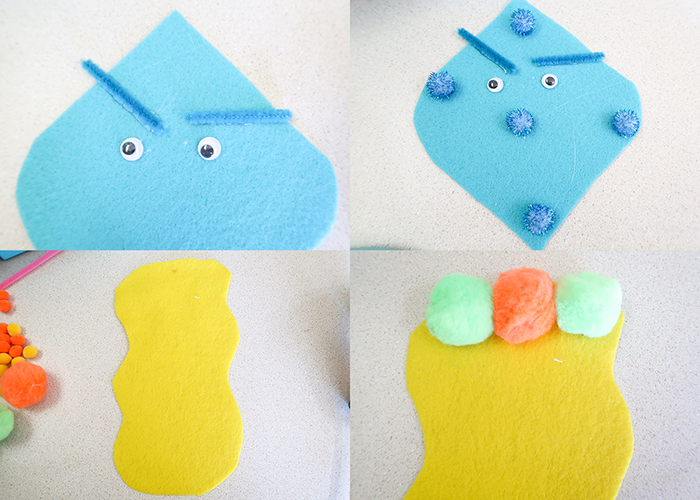 This is a great time to teach about freeform shapes too! Pick which shape you want to work with first. 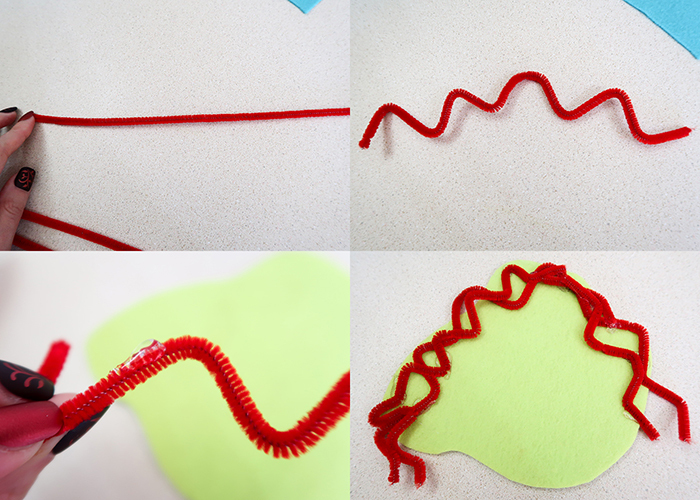 For our first monster, I’m going to take a few red pipe cleaners and bend them into wavy lines. 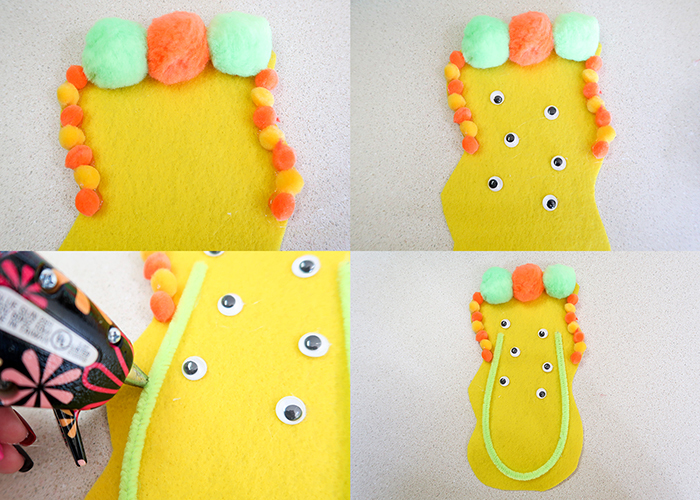 Then just add some glue, and stick them on your shape to create hair. Now add some eyes. This girl has 4 of them! 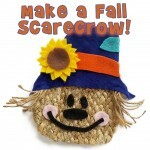 Add a cute pompom nose, and stack some beads together to make a silly smile. She’s all done! 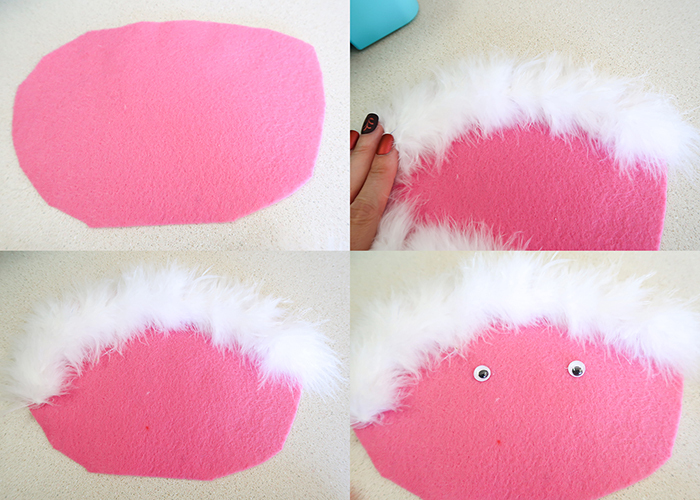 Next, lets make a fuzzy pink friend. I added a small feather boa for her hair, and just two eyes. 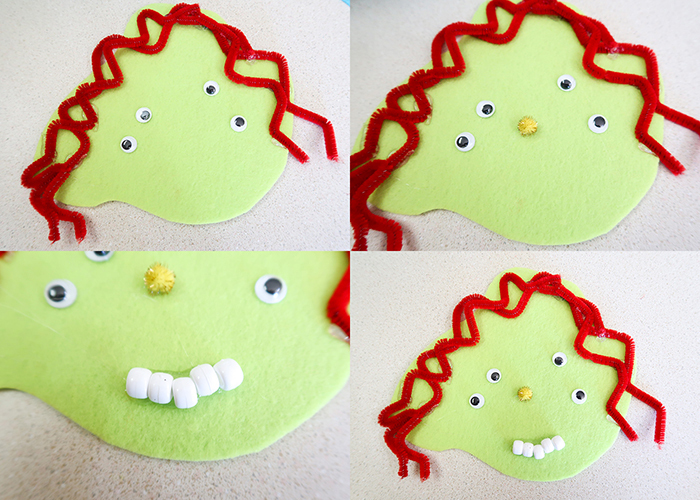 I took two large pom poms to give her big fuzzy cheeks, and bent a piece of pipe cleaner into a U shape for a smile. And don’t forget her sparkly purple nose! Now let’s work on a blue dude. He has a pointy head, and I gave him two eyes as well. That’s because his personality is all in his eyebrows. 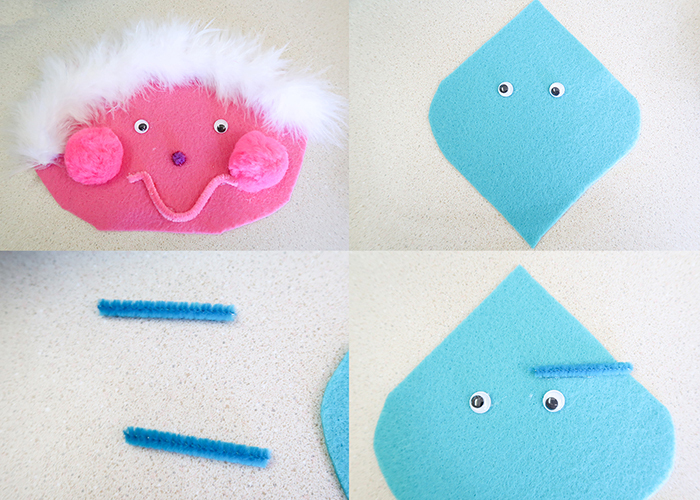 Cut two pieces of pipe cleaner, and glue one straight across above his eye. For the other eyebrow, glue it at an angle pointing down toward where his nose would be. Is he grumpy or concerned? I added some sparkly pom pom polka dots to his serious face. We’re almost done, we just need to finish up this tall yellow guy. 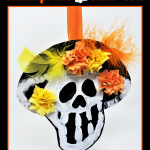 I added three large pompoms for a fun hairdo. And then added in some pom pom sideburns. He needed a lot of eyes, and a great big smile. You’re all done! I caught my monsters doing all kinds of silly things around my house. The red haired girl was reading books, and our pink fuzzy friend was relaxing on the couch. Our tall yellow monster was hiding the homework reading timer on the microwave, and this blue dude was reminding my kids that they can’t play on the computer until homework is all done! 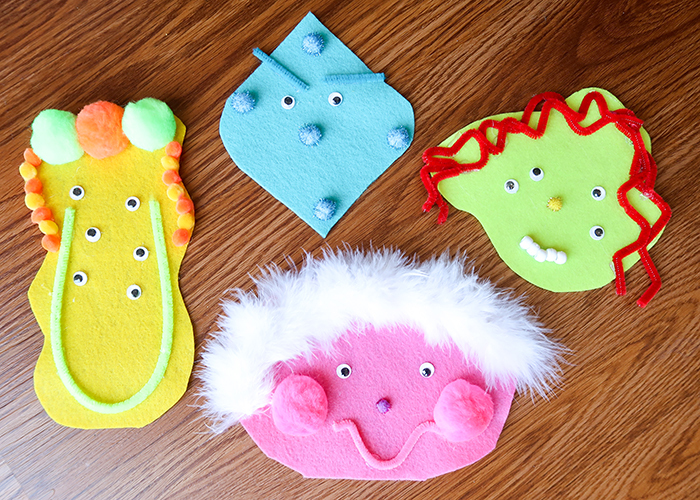 I hope you enjoy making this Fun Felt Monsters Kids Craft with your little ones!